The CMAT 2019 exam result has been announced on 6th February 2019 at 6:40 pm on the official NTA CMAT 2019 website. 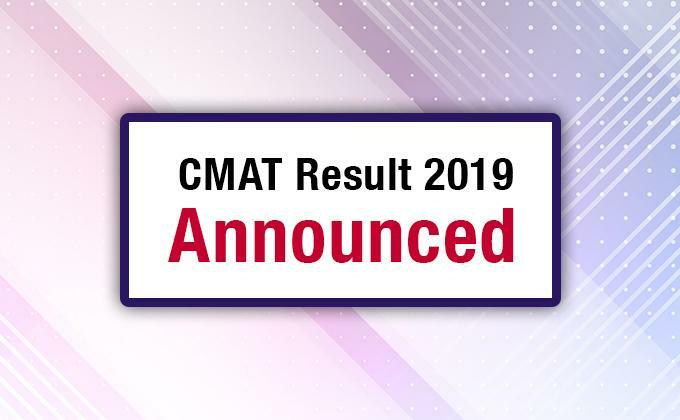 Click here to check your result for CMAT 2019. The students can also download their scorecard for CMAT 2019 here. 64,582 students had registered for the CMAT 2019 exam. The CMAT 2019 exam was conducted in 84 cities across 25 states in India on 28th January 2019 in two shifts – Morning (9:30 am to 12:30 am) and Evening (2:30 pm to 5:30 pm). The CMAT 2019 exam was rescheduled for 191 students from Kashmir region to 29th February 2019. The question paper and answer key for CMAT 2019 was released on the NTA CMAT website on 1st February and available for download till 3rd February 2019. The NTA CMAT 2019 authorities had invited a challenge from candidates who appeared for CMAT 2019 exam. They could challenge the CMAT 2019 answer key by paying an online sum of INR 1000 per question. So far, no challenge has been proved correct by the NTA-CMAT officials. The CMAT 2019 result is accepted by around 1000 AICTE-Approved Institutions, University Departments, Constituent Colleges, and Affiliated Colleges.